April is a great month that honors many things, including National Poetry Month and National Humor Month (hmm…do I sense a funny poem coming on?). In honor of National Humor Month, I’m running a joke-writing contest for kids. Please visit my website for details. If you know any kids who like to create jokes and riddles, please steer them to the contest. It’s going to be a lot of fun and the top three “comedians” will receive autographed joke books as prizes. Kids are amazingly creative at making up jokes and riddles, and there is nothing more joyful than hearing a child tell a joke (whether it’s funny or not). Telling jokes gives a child confidence and helps to develop his social skills. And we all know how valuable humor is to human spirit. 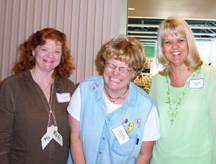 So let’s welcome in April with laughter, just like the woman pictured in the photo (taken at the 2006 Oregon Small School Association conference). She had been reading PET JOKES THAT WILL MAKE YOU HOWL! (co-authored with Ruth Musgrave, pictured on left). She couldn’t stop laughing–and you know how contagious laughter is!